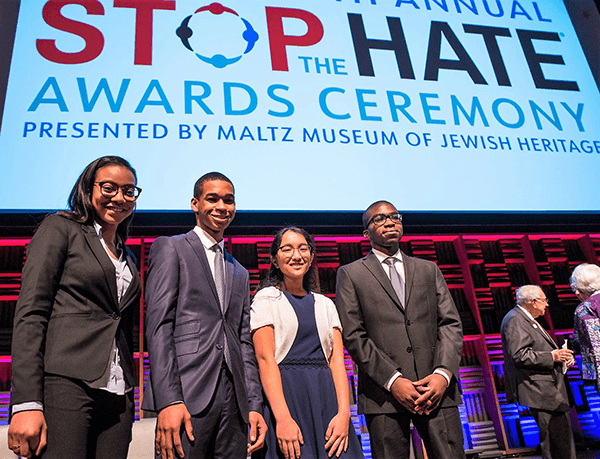 (CLEVELAND, OH) March 18, 2019 – During a prestigious annual event held in Northeast Ohio, ten high school juniors and seniors competed for the title of grand prize winner at the Maltz Museum of Jewish Heritage’s 11th Annual Stop the Hate® Youth Speak Out essay writing contest. 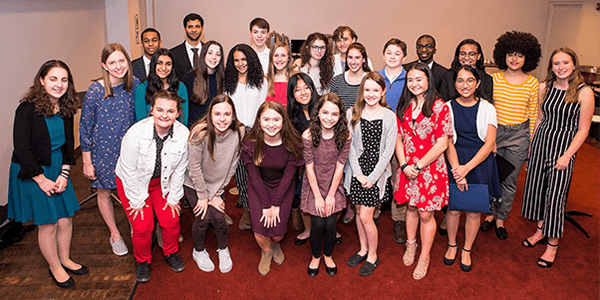 The contest, focused on students speaking out in support of diversity and inclusion, has engaged an estimated 30,000+ student participants across 12 Northeast Ohio counties and awarded $1.1 million to students and schools in scholarships and anti-bias education grants over the last eleven years. The top ten essays, selected from thousands of entries, were read for an audience of 600+ at The Cleveland Museum of Art as juniors and senior high school students vied for a chance to win the grand prize of a $40,000 scholarship. I believe that once we educate others and reinforce our shared humanity, we can do away with much of the ignorance, bigotry, and hatred that plague us as a society. While this is much easier said than done, the pursuit of this goal is well worth the work it entails. Samuel’s full essay reading from the event is available on the Maltz Museum’s YouTube channel (https://bit.ly/2W3mK3K) along with the other remarkable top ten finalists (https://bit.ly/2Ob1vdn). For the first time in the contest’s history, presenting sponsor, Dworken and Bernstein, announced a contribution of $100,000 to the Maltz Museum’s Stop the Hate initiative, in support of anti-bias education in Northeast Ohio. Irving Rosner, a principal of the firm, presented a check to co-founders Milton and Tamar Maltz; managing director, David Schafer; board chair, Grant Dinner; Stop the Hate chair, Darrell McNair; and, Stop the Hate vice chair, Scott Simon who was also the night’s emcee before the winners were announced. Antoinette M. Baker, AVP, Operations Manager, PNC; Greer Gibbons, Project Manager, The Lubrizol Corporation; Eduardo Kim, Partner, Thompson Hine; Gregg Levine, Consultant, Ratliff & Taylor; David B. Malik, Attorney, Malik Law; Leonor M. Osorio, DO, Cleveland Clinic – Lutheran Hospital, Hispanic Clinic; Monyka Price, Chief of Education, City of Cleveland; Cecilia Render, Executive Director, Nordson Corporation Foundation; and Carl Tyler, MD, Director, Developmental Disabilities – Practice-Based Research Network, Cleveland Clinic. Congratulations to all of the participants, finalists, and winners. Also, to the schools, teachers, readers, judges, and guests who helped make the eleventh year one of the best yet. For more information on the Maltz Museum, or to request a Stop the Hate group tour, please visit maltzmuseum.org or call 216-593-0575.